The economy is the primary issue in the 2017 presidential campaign for at least three reasons. The 1979 revolution was carried out in the name of the “oppressed,” but decades of international isolation and sanctions crippled the theocracy’s ability to deliver. As they go to the polls on May 19, Iranians are increasingly frustrated with unemployment, inflation and the gap between rich and poor. The economy is also largely the executive branch’s responsibility. In 2013, President Hassan Rouhani campaigned on the dual pledge of a nuclear deal with the international community followed by the lifting of sanctions to generate an economic boom. But the 2015 nuclear deal has yet to yield significant benefits for the average Iranian. 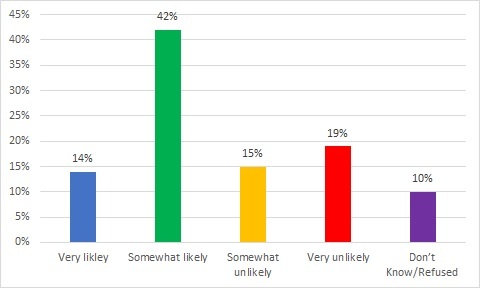 In an April 2017 poll, nearly two thirds of respondents said the economy was either “somewhat” or “very bad.” One month before the election, more than half of respondents, 56 percent, said Rouhani was “very likely” or “somewhat likely” to lose. But he has faced heavy criticism, especially from conservative candidates Ebrahim Raisi and Mohammed Bagher Qalibaf. Raisi, a senior cleric and former attorney general, called out the president for an unemployment rate nationwide of 12 percent—and 40 percent among students. Based on the Iran’s current five-year development plan, unemployment should be only eight percent, he said April 26 on state television. During the first presidential debate, on April 28, the most heated exchanges were between Rouhani and Qalibaf, the mayor of Tehran, over unemployment. Qalibaf said Rouhani failed to keep his promise to create four million jobs. Rouhani denied that he had ever made that pledge and called his opponent a liar. Qalibaf then held up a printed page from Rouhani’s website as evidence. Rouhani said his statement was taken out of context. He apparently had said an influx of 10 million tourists could create four million jobs. On May 1, International Workers’ Day, Rouhani said his administration had created some two million jobs. Both of the leading conservatives have made job creation a key pillar of their campaigns. Qalibaf pledged to create 5 million jobs during his first four years in office. He set up a website for citizens to enroll in a job-seeking registry. If elected, he promised to pay applicants $70 a month until they find positions, though he did not explain how he would pay for the program. Raisi has promised to create at least a million jobs annually. The front-runners are divided on the issue of foreign investment as a mechanism for job creation and economic growth. Rouhani has welcomed partnerships with foreign companies. “We should avoid scaring away foreign and domestic investors,” Rouhani said on April 27. 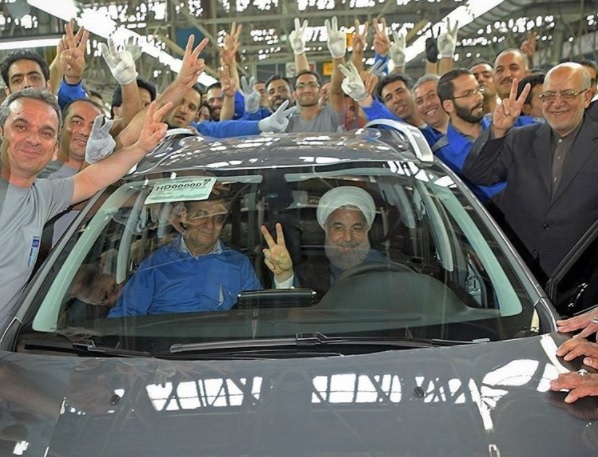 “We can attract 140 billion dollars in investment that can help to tackle unemployment.” On May 2, he inaugurated the production of a new car as part of a joint venture between French automaker Peugeot and Iran Khodro. Raisi and Qalibaf, however, share Supreme Leader Ayatollah Ali Khamenei’s vision of a “resistance economy” that prioritizes self-sufficiency and domestic industry. "The candidates should promise to focus on national capabilities and domestic capacities to resolve the economic issues ... rather than looking abroad," Khamenei said on April 25. Raisi echoed his advice on the campaign trail. “We should bring manufacturing enterprises back to production...and for this we do not need to look to foreigners,” he said. “The approach that we should wait for foreign investment and for foreigners to resolve our issues is wrong." In the second debate, Qalibaf said the government should focus on exporting Iranian goods to surrounding markets. He argued that Iran has enough resources of its own and does not need so much foreign investment. Raisi and Qalibaf have also taken Rouhani to task for the growing gap between the rich and poor. Both have favored increasing cash handouts to the poor, currently set at about $15 per person monthly. Raisi pledged to triple the subsidies. In the first debate, Qalibaf accused Rouhani’s government of serving the top four percent of Iranian society and being out of touch with the everyday life because of limited time and travel outside Tehran. He warned that another Rouhani term would endanger the revolution’s ideals, suggesting that current government has not upheld ideas such as social justice and equal opportunity for all. Encourage foreign investment and tourism to help create jobs. Encourage competition in the private sector to boost productivity. Increase women’s participation in the work force. A national apprenticeship program currently being piloted in two provinces will help tackle unemployment nationally starting in January 2018. 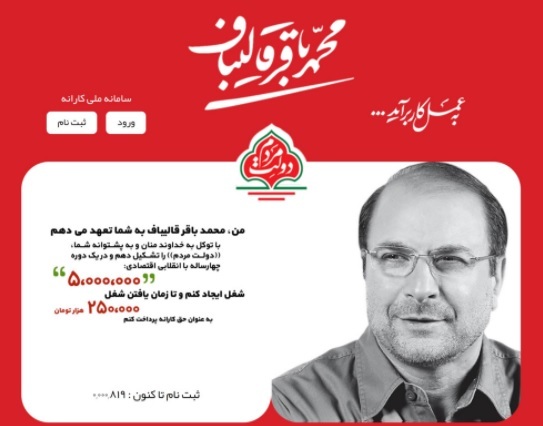 Triple cash handouts to poor Iranians to close the wealth gap. Waive income taxes for those earning less than 30 million rials (about $800). Create more than a million jobs per year. Release regular reports on status of corruption inquiries to increase transparency. Create five million jobs in four years. More than triple handouts to poor Iranians and provide emergency aid to 25 million individuals with low incomes. Create a national job search registry and pay applicants $70 until they find positions. Establish a ministry of foreign affairs and international trade, and the promote sale of Iranian goods abroad. Increase Iran’s gross national income by 2.5 times in four years. Cut down on smuggling and stop middlemen from inflating the prices of goods. Promote transparency by informing the public and judiciary of his assets and those of ministers and other top officials beyond what the law requires. Three other candidates are running for president. Mostafa Mir-Salim and Mostafa Hashemitaba have performed poorly in initial campaign polls and have not issued detailed plans for the economy. Vice President Eshaq Jahangiri, another candidate, is expected to quit the race in support of Rouhani. He has defended the administration’s record in the debates. Rouhani faces the difficult task of convincing the electorate that he has put Iran on the right path towards economic recovery through the nuclear deal. In April 2017, 56 percent of Iranians said Rouhani was “very likely” or “somewhat likely” to lose the election, according to a study by IranPoll.com. How likely do you think it is that President Rouhani might lose in the upcoming presidential election? 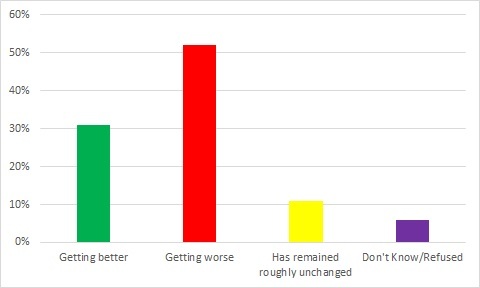 Some 72 percent of Iranians said the agreement had not improved the economy, and nearly two thirds of respondents said the economy was either somewhat or very bad. Is the economic situation of our country getting better, getting worse, or has remained roughly unchanged? Unemployment is perhaps the incumbent’s biggest weak spot. Some 55 percent of respondents said that unemployment or youth unemployment were the most important issues facing Iran’s next president. In a poll after the May 5 debate, respondents identified three economic issues as the first problem they want resolved by a new president: unemployment (39 percent), poverty and inequality (4 percent) and other economic problems (16 percent). In January 2016, the United States, the European Union and the United Nations lifted or suspended sanctions related to Iran’s nuclear program. Iran also regained access to the international financial system, repatriated billions of dollars in frozen assets abroad, and upped its oil exports. But overall economic recovery has been slow and uneven. One of Rouhani’s key achievements has been curbing inflation. It had reached 39 percent by the time President Ahmadinejad left office in August 2013. During the Iranian year that ended in March 2017, inflation was down to 9 percent. It was only the second time that inflation fell below 10 percent since 1990. Prices of basic necessities, however, have remained high. In 2005, when Ahmadinejad took office, 1,000 tomans could buy nearly 50 tomatoes, according to Rokna news agency. By time Rouhani took office in 2013, 1,000 tomans bought only six tomatoes. Under his administration, the situation only marginally improved. In 2016, 1,000 tomans could buy seven tomatoes. For the first time since the 1979 revolution, Iran’s crude oil exports hit 3 million barrels a day in early 2017. Oil and gas are the primary drivers of the economy, which grew 11.9 percent from March 2016 to November 2016, according to the Central Bank of Iran. The issue is that the economy is still overly dependent on energy, as the growth rate was only 1.9 percent without the oil sector. On May 3, Economy Minister Ali Tayyebnia acknowledged the recovery has yet to impact most citizens. “As Iran was mired in a deep recession following years of international sanctions, recovery has been underway but it has not been reflected in people’s lives, this is about to change,” he said. Iran attracted more than $12 billion in foreign direct investment between December 2015 and February 2017. Despite the nearly $10 billion increase compared to the previous year, these investments have yet to translate into significant job creation. Unemployment was 12.4 percent during the Iranian year that ended in March 2017, up 1.4 percent compared to the previous year. Unemployment for the age group 15 to 29 reached a staggering 25.9 percent, up 2.6 percent from the previous year, according to the Statistical Center of Iran. Rouhani’s government has recently emphasized aviation as an indicator of its progress. Iran’s airlines have aging fleets with poor safety records. After the nuclear deal, however, Iran bought or leased billions of dollars of new aircraft from Boeing, Airbus and other foreign aircraft manufacturers. In January 2017, the government held a special ceremony broadcast on state television to celebrate the delivery of its first Airbus jet—the first new aircraft since 1994. The administration hopes to boost tourism and create jobs by revitalizing the aviation industry. Tourism has increased by some 12 percent in the last four years. Conservatives have tried to undercut the government’s narrative. They have questioned the terms of the contracts, the selection of aircraft, and prices. Others ridiculed the reception ceremony for the Airbus jet. One hardline paper accused the government of covering up fatal train accidents by rolling out a red carpet for the planes. Garrett Nada is the managing editor of The Iran Primer website at the U.S. Institute of Peace.